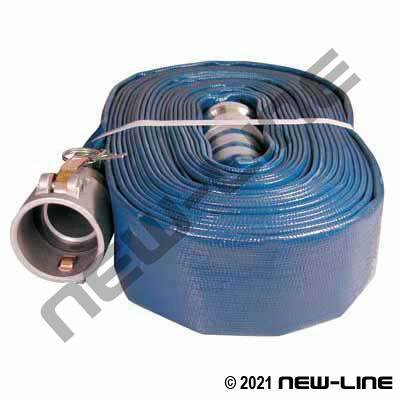 NL2410 Blue PVC layflat is an economy grade, light duty, thin wall hose designed for open ended discharge of water in non-critical applications such as: temporary or limited use open ended low pressure water pump discharge in the drainage of pools, ponds and small construction sites where no external abuse or dragging is present. THIS HOSE IS NOT RECOMMENDED for applications such as high volume water transfer, pressure pumping water over a distance, washdown, drinking/potable water or where there is any abrasion, dragging or external abuse of any kind. NOTE: NL2410 should not be confused with NL5080 Blue TPU Layflat which has an entirely different intended use. Notice: Thin wall, light duty. Refer to catalogue info/misapplcns.